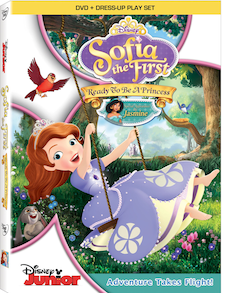 I remember watching the very first special of Sofia the First. It was so cute, but I had no idea at that time they were making it a t.v. show. I thought it was a one time deal. I was super excited when I first discovered that it was going to be a regular running t.v. show. My daughter is 6 and she loves watching this show, so when I was given the opportunity to review this new DVD I was super ecstatic. We just made the long trek from MI to Florida to go to Disney World. It was perfect timing and we received this DVD the week before we left. So we saved it for the trip. So we watched it in the car on the way down here. The DVD has 5 episodes on it. 1. A Royal Mess- James gets into trouble when he breaks a stained glass window, Sofia covers for him and he is able to go to the Goldenwing Circus, but she can't! 3. Blue Ribbon Bunny- Clover the rabbit shows off his skills and talents! 4. The Princess Test- The Princesses attend a Royal Princess Academy and there they learn a ton! 5. Two to Tangu- Princess Jasmine and a magic carpet ride make their appearance in this episode! The DVD comes with a free dress up play set with wardrobe. Avery loves to play with this. What kid wouldn't? I have never heard of the series, but I will have to check it out. I think my LO would love them.